​Concrete is a construction material that expands and contracts with the changes in moisture and temperature. Cracks may occur when provisions to accommodate these movements are not made in design and construction. Most random cracks that may appear at the concrete's early age rarely affect the structural integrity or the surface life of concrete. Why do concrete surfaces crack? The vast majority of concrete cracks usually occur due to improper design and construction practices. Design the members to handle all anticipated loads. Provide proper contraction and isolation joints. Place and finish according to recommended and established practices. Protect and cure the concrete properly. As mentioned above, concrete expands and contract with changes in temperature and moisture, which can cause early cracking. Joints are simply pre-planned cracks. 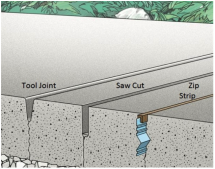 Joints in concrete slabs can be created by forming, tooling, sawing, and placement of joint formers. Joints provide relief from the tensile stresses, are easy to maintain and are less objectionable and uncontrolled than irregular cracks. Plan exact locations of all joints and include timing of contraction joint sawing before construction. Provide isolation joints between slabs and columns, walls and footings, and with curbs and other objects. Provide contraction joints and joint filling materials as outlined in specifications. Curing is the maintaining of an adequate moisture content and temperature in concrete at early ages so that it can develop properties the mixture was designed to achieve. Curing begins immediately after placement and finishing so that the concrete may develop the desired strength and durability. There are four important reasons to cure your concrete: predictable strength gain, improved durability, better serviceability and appearance. Concrete should be protected from losing moisture until final finishing using suitable methods to avoid plastic shrinkage cracking. 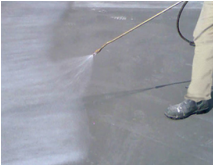 After final finishing the concrete surface must be kept continuously wet or sealed to prevent evaporation for a period of at least several days after finishing. 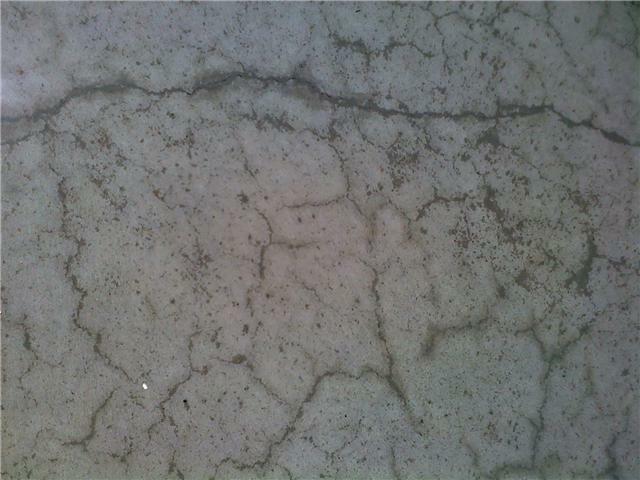 Crazing is the development of a network of fine random cracks or fissures on the surface of concrete or mortar caused by shrinkage of the surface layer. Typically craze cracks develop at an early age and are apparent the day after placement. They do not affect the structural integrity of concrete and rarely affect durability or wear resistance. Why do concrete surfaces craze? Concrete surface crazing usually occurs because one or more of the rules of "good concrete practices" were not followed. Use moderate slumps (3-5 inches) of concrete with reducing bleeding characteristics. Follow recommended practices and timing, based on concrete setting characteristics, for placing and finishing operations. Cure properly as soon as finishing has been complete. Building relationships one pour at a time!